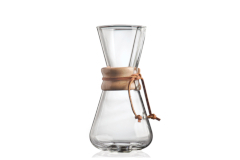 The Chemex® Coffeemaker is a manual, pour-over style glass-container coffeemaker that was invented in 1941 and has remained unchanged for 77 years and counting. 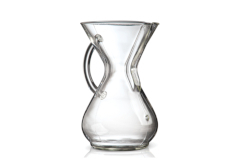 Inspired by the Bauhaus school of design the hourglass shape has now become an iconic part of American history. 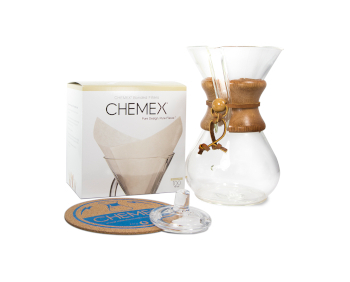 The Chemex® coffeemaker, together with Chemex-Bonded® Coffee Filter, makes a well-rounded cup of coffee that brings out the subtle notes hidden in your coffee beans. 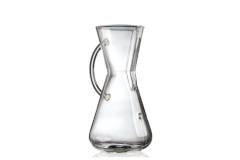 The coffee only comes in contact with the scientifically designed filter and non-porous Borosilicate glass. 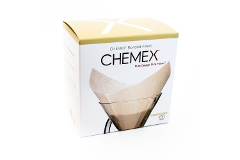 With the Chemex® method, you can make coffee as strong as you like without worrying about any bitterness. 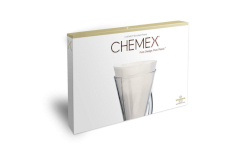 With a wide range of size options and two different styles to choose from, the Chemex® can satisfy just about any java craving. 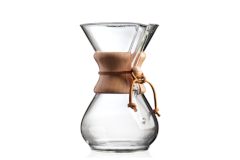 The Chemex® is pure in both form and function.